I'm back at Symposium's Mission Critical HR Analytics conference in September. Ie I'll show you how you can do simple but strategic analytics, and without the need for great technology, clean data or having to wait 10 years until you've got these. 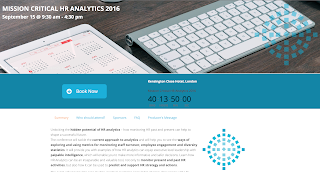 You can also see a summary of my session on employee engagement analytics last year.